Hi everyone! Happy Monday! Hope you guys had a great weekend. My busy and fun-filled weekend started with the amazing Nordstrom Fall Beauty Trend Show early Saturday morning. It was nice being part of the show (2nd year in a row) and I met other awesome DC bloggers. After the show, we chatted with the host and East Coast Beauty Director who was awesome, fun, energetic and sweet. I had an amazing time and a great makeup specialist converted me to a NARS girl ;) A special thanks to Nordstrom Pentagon City’s team for the lovely day. It is the official start of fall and the perfect time to bring out my "forest green" suit - one of my favorite fall colors. I paired the suit with a mustard top which is another favorite fall color of mine. Putting on Berry lipsticks is a must for fall and I went with it rather than my staple ruby woo lipsticks. I combined the MAC Ruby Woo and Rebel lipsticks to get the color. I completed the look with dark leopard pumps and my new favorite brown bag. What a great suit for Fall. 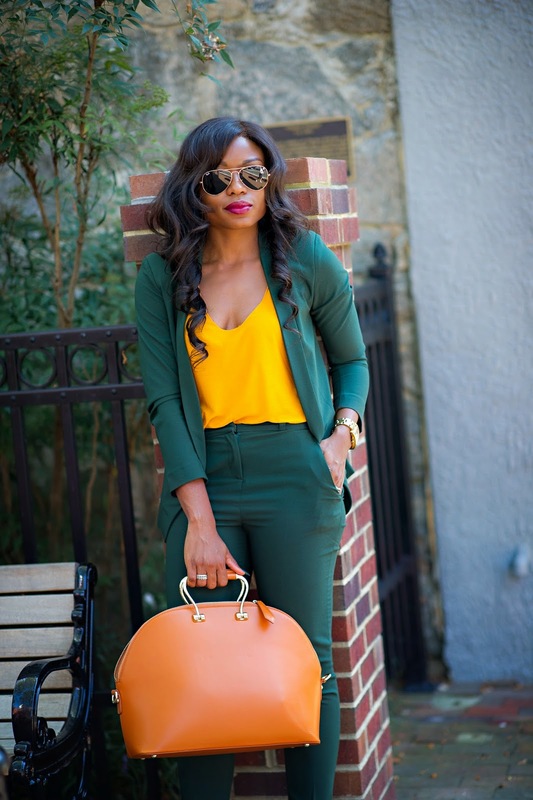 such wonderful color combinations in this look! Great outfit! Very cute look on you, love! Elegant and posh look. Love every bit of it. The colors look gorgeous on you. I'm obsessed with your handbag, it seems to go with everything! Absolutely gorgeous! Perfect colorful look for fall!